Another thread on how fast but from the drivers view. Have a drink. Some folks insist that the "have" to drive at 70 to 80 while pulling 15,000 pounds of trailer on old, too small tires. I had to jump in with this reply. My reply on forums like this one is from the viewpoint of trying to give the best answer from the point of extending the life of your tires. Personally, as a retired professional race car driver, I don't buy the "Speed Kills" mantra. If that was true I would have died in the 70's when I started racing. IMO it is inattention and the false belief that "I am the best driver around" that most people seem to believe. If you are listening to the radio you are not paying attention. Worse, if you drive and are having an extended conversation or listening to an audio book or the news, you are not paying full attention to the task at hand. Do you keep both hands on the steering or just a couple fingers from one hand? There are more but you should get the question. Having only driven cross country 4 times I have a little experience but do not understand those who claim you have to drive the posted speed or "get run over". I set my cruse at 62 to 63 and do not recall anyone passing and honking their frustration. But then I keep to the right lane and keep an eye on the vehicles behind me so the occasions when I pass a slower vehicle I do not pull out in front of someone who feels they own the highway. As a Tire Design Engineer, I know that tires have a finite life of cycles and tread wear is not the only limiting factor. The higher the load or lower the inflation or faster the speed or hotter the temperature or longer you park the tires in full sunlight, the sooner you will "consume" the finite life in any tire, no matter the brand. There are just too many variables to predict the moment when a tire will "give up the ghost". Also, tires do not always fail the instant you have done "fatal" damage to them. Sometimes it might take many miles or days or weeks to come apart and surprise you while you are drinking a coffee with one hand and steering with your knees. 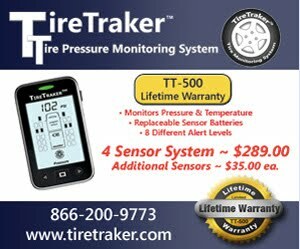 This blog has over 300 posts on the numerous ways you can damage tires and shorten their life. I still get replies, almost every day, from those who think that because they haven't had a tire "Blow Out" or been surprised with a tire failure they know all there is about tire life and proper usage. There is a saying a friend uses frequently. "You can lead a horse to water but you can't make them drink". IMO this blog is a large body of cool clean refreshing water, and it's free. Drink up. There are many posts on how to learn the calendar age of tires by reading the DOT serial number and "de-coding" the last four digits to learn the week and year a tire was made. But just knowing the calendar age doesn't tell you the useful life of a tire. Some folks think ten years or longer is OK; others think it is a good practice to change every two years. We each have different operating conditions which affects the "functional age" of our tires. I arranged for a poll to be taken on RVTravel.com. 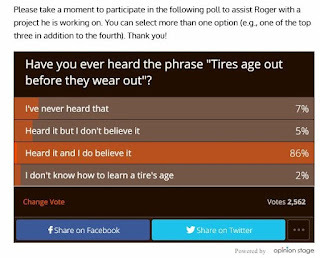 It asked the question: "Have you ever heard the phrase 'Tires age out before they wear out?'" I was pretty sure that many of you had heard the phrase, but now I have the numbers. Just read a tale from a Class-A owner who suffered a sidewall puncture on a weekend and had serious difficulties getting service or replacement tire even though he had been paying for RV Roadside Assistance. I have posted about spare tires on this blog and on various RV forums. The assumption that having "Roadside Assistance"policy is good enough, many times does not work as well as the advertisement. Competent truck tire service centers have the ability to change tires at the side of the road but it appears that the insurance companies (ones selling the idea of assistance) are really only knowledgable about cars. I have suggested that if you don't have a spare you should be able to get a used tire, in your brand, type and size and find some way to carry it around. Used tires should cost closer to $50 for 22.5 sizes and if you know a fellow RV owner who is getting new tires I bet you can make a deal. Having a tire only, would allow a regular truck tire service truck to come out, mount, inflate and change the tire. You still will need a new tire but you should be able to get a better price on a new tire somewhere in the next couple days when you have time to do some shopping around. Your "old" spare tire should be thoroughly inspected but should be OK for a few hundred miles at 55 mph max on a rear dual position. The load formula that resulted in the numbers in the Load & inflation charts has not changed since the late 60's. That formula was based on a 65 mph MAXIMUM operating speed. The lower speed was the trade-off you get when you increase the load capacity. "THERE IS NO FREE LUNCH"
Look at the load capacity of a similar sized LT tire. If ST tire companies suddenly discovered some magic rubber or special tire design feature why don't they put that magic stuff in the LT and Passenger tires? The "Speed Symbol" is simply an indication of temperature resistance of a tire on a short-term(30 min) step speed test. The symbol is based on an SAE test that specifically is for Passenger type tires. ST type is not covered by SAE. Those who choose to run at 65+ need to remember that you are "consuming" the finite number of cycles that make up a tire life. Faster speed = higher temperature. Higher Temperature = shorter life. This a Science folks, not magic. So please when you have a belt separation failure before you wear out your tires please do not come back here with some complaint about "Defective" tires of "China Bomb" tires. You were warned but decided to not heed the warning and advice. The high load capacity in ST tires was developed based on a stated 65 mph Max speed. IMO The addition of higher speed ratings was not accomplished with improved engineering but because of Import Tariffs being imposed on non-speed rated tires by US Dept of Commerce in 2017 and as if by magic each and every tire company making ST type tires almost overlight added high-speed capability to the tires. There were no years of incremental improvements in speed capability. If that were the case we should have seen so 70 mph tires then 75 etc but we didn't. Some have suggested the increased speed capabilities are the result of years of incremental improvements and that tire companies have seen numerous slight improvements. I understand this concept. The problem is I don't know how to exceed a "Step Speed" test and translate a non-specified step into a speed capability that is not part of the test. "S7.4 High speed performance. (a) Perform steps (a) through (c) of S7.2. (b) Apply a force of 88 percent of the maximum load rating marked on the tire (use single maximum load value when the tire is marked with both single and dual maximum loads), and rotate the test wheel at 250 rpm for 2 hours. (c) Remove the load, allow the tire to cool to 35 °C (95 °F), and then adjust the pressure to that marked on the tire for single tire use. (d) Reapply the same load, and without interruption or readjustment of inflation pressure, rotate the test wheel at 375 rpm for 30 minutes, then at 400 rpm for 30 minutes, and then at 425 rpm for 30 minutes. (e) Immediately after running the tire the required time, measure the tire inflation pressure. Remove the tire from the model rim assembly, and inspect the tire." The RPM converts to 50mph, 75 mph, 80 mph & 85 mph so the steps are not linear. What would you consider exceeding the specified test by 15% look like? run 34.5 minutes at 85 or run another 30-minute step at 97.75 mph? The Speed test above is required for a variety of tires with ST being one type. LT and Pass tires have different standards and different test requirements. None of the DOT tests support any "Speed Symbol" claim as DOT doesn't recognize the speed symbol. SAE high-speed test is not a regulatory test. "This SAE Recommended Practice provides a method for testing the speed performance of passenger car tires under controlled conditions in the laboratory on a test wheel. This procedure applies to “standard load,” “extra load,” and “T-type high-pressure temporary-use spare” passenger tires." If you only want to look at dimensions, load & inflation I don't know why all three wouldn't be rated for 1,703 to 1,760# load capacity. Why haven't the tire companies put the same better construction features they apparently are putting in the ST tires in the LT tires? where load capacity is an important factor in selecting the vehicle?